General. 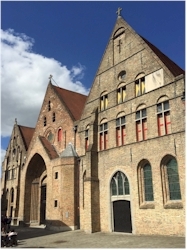 Saint-John's hospital (Sint-Janshospitaal) is one of the oldest remaining sites for health care in existence and for centuries it was the most important site in Bruges for the treatment of sick people. At the time of its foundation its function was not limited to the health function but it also was a place where travellers could find shelter or the needy (in the broad sense of the word) could find help. So at that time it was more a guesthouse than a clinic. Gradually it evolved to a real hospital in the meaning we know now and it remained a working clinic until 1978 when a new modern hospital was built outside the town center. Nowadays it has a museum function and is a venue for exhibitions, congresses and other events. Brief history. The hospital was founded in the 12th century. The oldest remaining parts date back to the 13th and 14 century, making it one of the oldest health care institutions that still exist. The medieval hospital halls show a mix of romanesque and gothic architecture. In the course of the years, the hospital continued to grow and by the 19th century it was enlarged by the construction of a new complex in neoclassical style. Patients were treated in this new complex until the 70's of the last century. By that time, the new modern hospital AZ Sint-Jan outside the center was ready. Museum. The oldest part of the complex now serves as museum where you can learn more about the life in the old hospital. There is also an exhibition on one of Flanders' most famous artists (Flemish Primitives): Hans Memling. While there, don't forget to have a good look at the monumental roof. The 19th century complex is used for exhibitions, congresses and other events.